From tomorrow things are changing drastically for Danish ex-pats. One of the main problems is that no one has told the Danes! Basically from midnight consulates will be banned from issuing passports to ex-pats (or children of ex-pats when they are born abroad), only embassies will be allowed to issue all future passports (because of finger-printing equipment). Thomas found out completely randomly a month ago because his passport was due to run out just after the new year. He phoned the consulate (in Bishopbriggs) to make an appointment and they told him to hurry up because the only embassy in the whole of the UK is in London! If he'd found out three weeks later, he'd have been obliged to do the round trip to London (twice) to apply for and then pick up his (and, as it happens, the girls' passports). Obviously two return flights to London cost slightly more than two round trips to Bishopbriggs! Being up north in say Wick would of course be even worse but there are many countries with a reasonably high ex-pat Danish population where there is no embassy! Take New Zealand. If Thomas and I lived there instead of here, he'd be obliged to go twice to Sydney to get a new passport. When Amaia was born he'd have been obliged to take her to Sydney to get her first passport... which begs the question - how would he have got her into Australia without a passport or visa to get her first passport?! Family passports aren't synchronized either so a person with two or three kids could end up having to fly back and forth every other year. 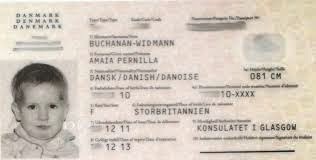 For instance Amaia's current Danish passport runs out in 2013, Anna's in 2016, Amaia's replacement would run to 2018 and Thomas's would be up in 2021 - that is a fair number of plane trips to the embassy! Someone hasn't thought it through! Anyway Thomas is so incensed he's started a Facebook group to alert people to the change, and of course to try eventually to pressurize his government into a rethink. I'll keep you updated on the revolution!